Good evening, my fellow wrimos, wherever you are! It’s me, reporting in from Day 1 of National Novel Writing Month 2016. I managed to finish up the previous chapter I was working on last Friday night so I could start clean today with the next chapter in the continuing saga of The Curse of Camlann. That’s the new book cover for this year at right; if you’ve looked me up on the official NaNo site, you’ll see it there as well. All in all, it was a pretty good start! Today marks the first of many lunchtime write-ins I have scheduled with a fellow co-worker who’s also doing NaNo. We blocked off time in a small conference room, brought in our snacks, and got to work. I admit, I got a little farther along than Kel did, only because I had all my prep work done and she had a bit to do before diving in. Me, I wasn’t completely sure how I was going to start the scene, considering I’d kind of flaked out on the ending of the last scene by having the heroine faint. I know. I know! But considering she was still in shock from a) finding our hero dead after being killed by her ex-husband at the beginning of the scene, only to have b) our hero come back to life a moment later, having her faint when our hero tells her he’s been alive since 506 AD and fought alongside King Arthur, it seemed like a logical option at the time. Thankfully, I figured out my opening and my trusty outline helped me get to 1,026 words in an hour, which is mighty fine. I even had an amusing moment when I did a ‘Net search for “expensive whiskey” to find out what my hero might have in his wet bar. That’s probably not the sort of thing one should Google while at work, but in my defense I was on my lunch hour. It’s now past quitting time and I’ve added to my previous count to meet my daily goal and then some. Hurray! This bodes well for the rest of the month. My first eight word count books of my first of two word tracker pages in my Bullet Journal are to be colored in as well, this time in blue as that’s the color I associate with NaNo. I am also realizing I need to look at other pages for tracking other milestones, such as “nano update blog post written” and “days written” to name a couple. I’m sure more will occur to me, but that’s the beauty of a bullet journal; you can add them in wherever you think of them and because of your index they’re easy to find. I also have a year of journaling under my belt, whereas last year around this time I had oh a week, so I understand more about how the system works and how to adapt it to my way of tracking tasks. Speaking of tracking, check out my new widget in my left menu where I’ll keep you up to date on my progress and comment on the overall day. Just expand the menu to see it. Okay, I’m off to go play with my new toy (a spiffy new laptop!) and relax a little. Talk to you soon, wrimos! One of my writer friends has published her second book in a really nifty series. Go check it out! 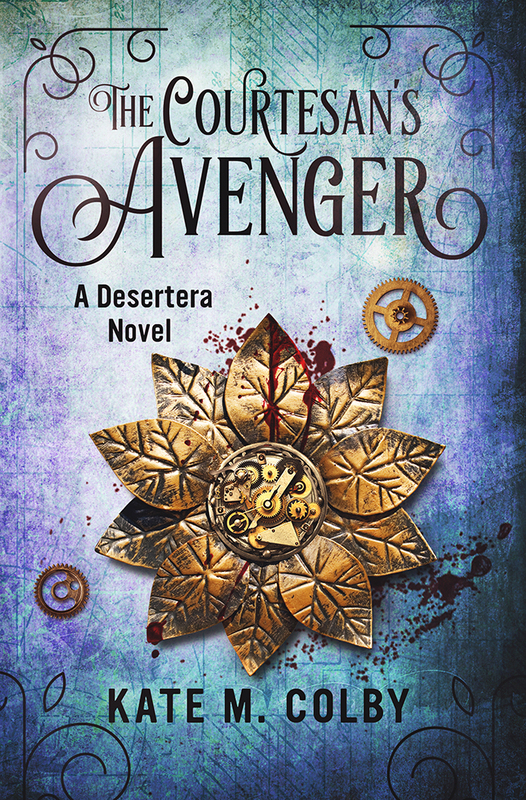 After over a year of working and waiting, I’m pleased to announce that The Courtesan’s Avenger (Desertera #2) is available in ebook AND paperback formats on all major online retailers. First and foremost, I want to thank everyone who has helped me get to this point. I couldn’t have published one book, let alone two, without the support of my family, friends, and fellow writers. My readers deserve a special thanks: your encouraging emails, social media shout-outs, and heartwarming reviews are the fuel that keeps my inspiration burning. Thank you joining my journey.